This article is about how to be gentle with yourself, especially when you don’t know what to do next and that little voice in your head is telling you there’s no way you can succeed! Do you ever struggle with negative** thoughts and feelings? Have you tried really hard to get rid of them? If you answered yes to either of these questions, then welcome to Planet Earth, final destination inner peace (we hope!) Having had the privilege to read for thousands of people, one of the things I see over and over again is that being human involves being confused. In fact some of the most successful people I’ve met are also the most confused. The difference is that they don’t let their confusion stop them from reaching their goals, at least not for very long. They are comfortable with the idea that we are all channels for energy and they allow their contradictory thoughts and feelings to flow through them, like sticks and stones down a river. Living in this non-judgemental way allows them to save their energy for important projects and relationships instead. So how can we learn to conserve our energy instead of spending it on criticism and negativity? Well, for me, dealing with my energy is a healthy way is like living on the edge of a volcano. Volcanoes are a great example of how energy can be used positively (to form new mountains and continents) or negatively (to destroy civilisations). Just like a volcano, I’ve noticed that I ‘send out smoke’ when I’m annoyed, ‘blow up’ when I don’t get my way, and sometimes have a ‘meltdown’ when I ‘lava’ (or anger) onto the people or situations which annoy me. Can you relate to this? -Notice that we are all living on volcanoes (even the Dalai Lama finds meditation hard at times!) so we might as well help each other to succeed. SO – are you still trying to get rid of the volcano of your negativity or are you busy making the most of the fertile soils (and going with the lava flow, so to speak)…. If you don’t know the answer then have a look at your hands, especially the line that encircles your thumb (your Life Line). Your Life Lines shows me how much energy you have to overcome obstacles. It indicates your physical fuel tank and whether you are using your energy in a constructive way. A line that smoothly runs around the thumb to the bottom of the hand suggests you have a wonderful ability to keep going despite the odds (i.e. you’re a ‘good finisher’). Compare the Life Line in your Active (writing) hand with your Passive (non-writing) hand. Which Life Line is darker, longer, smoother or more noticeable?? If your Active Life Line is stronger than your Passive Life Line, you are an OPTIMIST who believes you can change the world through personal effort and willpower. You love living on the volcano because that’s where the action happens. If your Passive Life Line is stronger than your Active Life Line then you may be a PESSIMIST – it’s possible you are so used to ‘giving and giving’ that you currently feel exhausted. You feel at the mercy of the volcano so maybe it’s time to take some time out and refill your energy. If your Active and Passive Life Lines are fairly similar then you are a REALIST and take things as they come. Volcano, schmolcano you just get on with life whatever it throws at you. 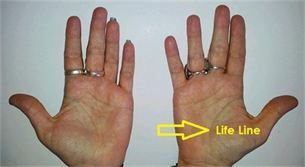 Picture below: See how the Active (right hand) Life Line is darker and longer than the Passive (left hand) Life Line. This client has improved her energy levels in life through an active lifestyle and positive thinking. SO, over time we can see the results of an optimistic vs pessimistic lifestyle in our hands, especially in our Life Line. Our hands love to talk to us so the sooner you learn to interpret and communicate with them using palmistry the easier it will be to see if you are heading in the right direction in life. The body never lies! I hope you’ve found this post interesting. As always feedback is most welcome – please post comments below or to my facebook page Psychic Readings by Sarah.If you would like to book a reading, please SMS me on 0408 898 028 or visit my bookings page. **I note that some people believe that there is no such thing as positive or negative energies, and that we are all one.This is true at the spiritual level, but not at the physical level. For example all water is made up of H2O molecules but they can take many different forms such as ice, snow and steam. Perhaps a better way to explain this concept is to talk about your energy BALANCE. If you life is full of energy producing (positive) situations (such as laughter, uplifting music, love, affection, gratitude, peace, relaxation and sunshine) you will consistently have enough resources to conquer any challenges that you come across. A Psychic is a person with special gifts and talents and some people will openly share these gifts by offering psychic readings. A psychic reading can reveal so much hidden information about a person and the life path they are on in this life time. Thanks for the post. Like any machine body requires regular care and the food we eat serves as the fuel for the body, which helps to provide energy required by us to carrying out everyday work. Thanks for the post. I am happy to find this content very helpful about the life line energy level and informative for me, as it contains lot of accurate detailing about the topic, which I was searching for. Thanks a lot and good luck.